In the early days of the study of radioactivity the concept of ‘radiation protection’ did not even exist (and there were certainly no ‘radiation-protection officers’!). Physicists like Becquerel , Curie and Hahn handled relatively large quantities of radioactive substances with their bare hands. In addition to this, any radioactive material given off as gas or airborne dust was frequently inhaled. Even today the logbooks of Marie and Pierre Curie are contaminated by radium (half-life 1600 years), and they can only be loaned out from the Bibliothèque Nationale in Paris with special conditions. Insisting on perfect safety is for people who don’t have the balls to live in the real world. 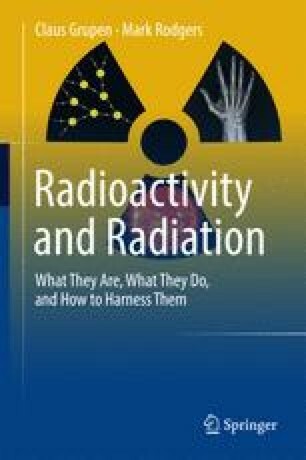 Practical aspects of radiation protection require the existence of suitable safety techniques. Laboratories must have strict procedures in place, and the disposal of radioactive waste must be performed with care, and with all relevant standards being followed. Some very simple rules can be identified: keep a good distance from the radioactive material, use appropriate shielding, restrict the time working in the presence of the material, limit the activity of radioactive substances used, and, if possible, avoid contamination, ingestion and inhalation, or at least reduce them to a minimal level.